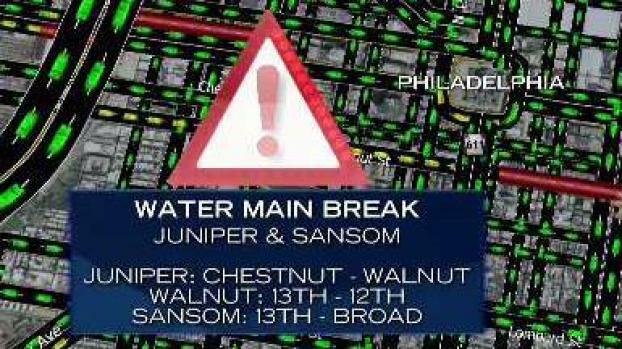 The break at Sansom & Juniper street spilled millions of gallon of water onto city streets while causing water pressure, flooding and traffic problems. Crews are working hard early Wednesday to clean up the mess from the huge water main break in Center City. Some area businesses experienced flooding and a lost of power. A 48-inch main broke early Tuesday sending water gushing onto streets around Juniper and Walnut Streets in Center City Philadelphia Tuesday. The water didn't recede for hours. Once it was gone, a muddy mess and crater remained. There is no timetable for when the crater will be fixed. 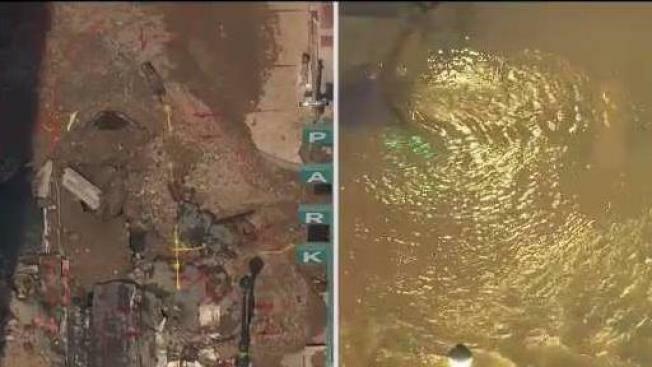 The clean-up effort continued Wednesday, more than 24 hours after a massive water main break sent millions of gallons of water onto Center City Philadelphia streets, causing traffic, power and water problems. The 48-inch main broke around Sansom and Juniper streets around 4 a.m. Tuesday, leaving Juniper Street buckled toward Walnut Street. The worst of the flooding seemed to center around Walnut and Juniper streets but spread several blocks in each direction for about three hours. There were reports of low water pressure throughout Center City and into South Philadelphia, Graduate Hospital and Bella Vista. Power was also knocked out to more than 1,000 customers. And, dozens of Midtown Village businesses had to close due to the effects of the water main break. Philadelphia Water Department crews worked overnight to clean-up the muddy mess on area streets but the actual crater remained. It could take months to get Juniper Street back to normal, PWD spokesman John DiGiulio said. Crews hoped to get 13th Street from Walnut to Chestnut open Thursday. The closure along Sansom Street to Broad Street could take longer. There are still some road closures due to the massive water main break in Center City on Tuesday . NBC10 First Alert Traffic reporter Jessica Boyington shares the roads to avoid. There was no immediate word on the cause of the water main break and it could remain a mystery, officials said. Water Commissioner Debra McCarty said a recent inspection of the main using technology that goes inside the pipe turned up no problems. She said she didn't believe the extreme heat that has scorched the region in recent days was a factor in the break.